The $ 4.5 billion Trans Mountain pipeline is a good example of the betrayal of the political class that I spoke about a year ago. The decision Justin Trudeau just made is a betrayal of my generation to young people. Finance Minister Bill Morneau announced on May 29 that the Government of Canada will buy the existing Trans Mountain pipeline system from Kinder Morgan at a price of $4.5 billion. When asked about the cost to build the expansion during his press conference, Mr. Morneau was cagey. 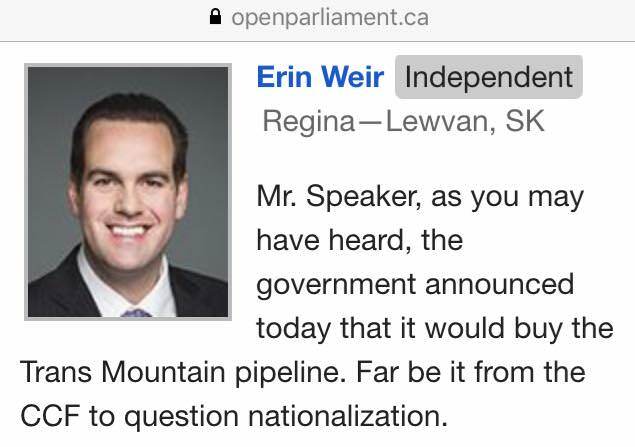 He refused to explain that $4.5 billion simply buys Ottawa the rights to what exists today — a 65 year old pipeline serving B.C. and Washington State, storage facilities and a one-berth marine terminal that sends modest volumes of diluted bitumen to California markets. The Texas based company — forged from the executive offices of Enron — plowed ahead anyway. It relied on the National Energy Board (NEB) as an industry-captured regulator to help in the cover-up of the project’s commercial challenges. Then, the company played the huge egos of desperate politicians who based project approval on back room deals rather than proper due diligence. Ottawa never did the job it should have to protect the public interest. It never understood the project’s compromised financial case, or how it was cobbled together. To justify the "national interest" claim for Trans Mountain’s expansion, Ottawa has made up numbers on jobs and oil revenue benefits. Ottawa claimed 15,000 construction jobs when Kinder Morgan’s application to the NEB explicitly stated it expected an average of 2,500 — and these would exist only for two years during construction. A cursory read of Scotiabank’s report reveals a passing mention to $15.6 billion a year. But Scotiabank doesn’t rely on that figure. If no new pipeline capacity is built, Scotiabank says the annual impact will be $7 billion — less than half what Ottawa and Alberta say. How did Ottawa and Alberta come up with $15 billion in lost revenue from lack of pipeline capacity? I contacted the Prime Minister’s Office and was re-routed to Minister Carr’s. NRCan confirmed no internal assessment. Scotiabank was their primary source. Premier Notley’s office confirmed Scotiabank as its only source. I called the bank. The annual loss predicted (if no new pipeline capacity is built) is $7 billion, not $15 billion. Did anyone in government read Scotiabank’s report beyond bullet points? Still, it’s a big number. How is it that some of the most sophisticated heavy oil conglomerates in the world find themselves trapped taking an unfair price in U.S. markets costing $7 billion a year? The short answer — they don’t. Scotiabank’s report is a work of fiction. Prime Minister Trudeau’s characterization of sophisticated big oil companies being “trapped” reveals his lack of understanding of how the industry is structured. Oil producers knew a bitumen export plan would increasingly expose them to the volatile light-heavy discount. They adopted a variety of price mitigation strategies beyond integrating operations with refineries they own in the US. This is why, for example, Suncor CEO, Steve Williams can tell shareholders, “We have virtually no exposure to the light/heavy differential." In fact, a U of C study put the value at $14 B annualy, but obviously this number is always shifting based on markets. "The federal government has declared war on Indigenous people with its plan to buy the Trans Mountain pipeline. That's the feeling of activist Kanahus Manuel who calls the Secwepemc home. The pipeline, which is owned by Kinder Morgan, runs through 518 km of her territory. 'They are declaring war on our people because we have said no. We have said no, no passage. You cannot bring this pipeline through our lands,' she said. 'I'm willing to go into death with my death song into battle against Kinder Morgan right now. There's no way we're going to allow Canada to get away with this..."
Trudeau will live to regret the day he imagined he could push his black snake through Secwepemc territory. This is not Tzeporah Berman speaking. This woman means every word she says. The Canadian food company known for its organic cereals and granolas has become one of the first major businesses to launch a campaign against the push for a fossil fuel and oil tanker expansion project that has prompted fierce opposition in British Columbia. Standing apart from prominent business lobby groups, including the Greater Vancouver Board of Trade and the Canadian Chamber of Commerce, B.C.-based Nature's Path is urging Prime Minister Justin Trudeau's government to stop backing the Trans Mountain pipeline expansion to the west coast. "This movement is bigger than us alone, and we all need to step in to make sure that we have a thriving future,” Nature's Path executive Jyoti Stephens told @NatObserver as her company went public about its opposition to the Trans Mountain expansion. Obviously, nothing can be built anywhere without individuals taking it upon themselves to misrepresent their own views as speaking for the majority or, 'the people'. Opponents of this project constantly assume they are in the majority when evidence consistently proves otherwise. Similar to any other undertaking of national significance, malcontents will attempt to leverage media outrage but, the situation on the ground will be much different. Even the Trudeau Liberals realise that Canada will become ungovernable if mob rule replaces the rule of law. There are many mitigation strategies available to prevent conflict and the security of crowds should not give lawbreakers false hope. I looked at Scotiabank's 2017 Annual Report. They say they have $168 billion in business and government loans. They do not say who those loans are to. However I think they are up to their neck in tar sands loans. A significant chunk of that. This action is probably as much of a bailout of Scotiabank as it is of Alberta. "The gov't is using taxpayer money to buy a doomed asset with no value." Commit to holding public consultations on Kinder Morgan in every riding across the country. If Kinder Morgan’s shareholders get to vote on this deal before it’s finalized, your stakeholders - everyone in Canada - deserve a say before you put public funds, the climate, and communities at risk. Everone gets a say - on Election Day. That's how it works. The "doomed asset with no value" you refer to supplies BC with almost all of its oil. It is and always has been quite profitable. I know, I know, arithmetic is really hard. "The NDP couldn't run a lemonade stand" WAC Bennett. How do you spell non sequitur again? 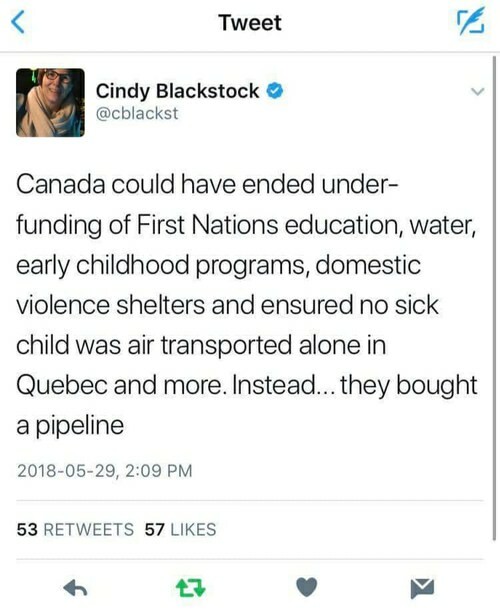 Are you suggesting Canada's problems will disappear if we just gave the money to Quebec and shut up? Oh, right. ..glad to see this change although i must confess i can't remember when it did. but now industrialists, oil barons and bankers will just have to queue up with the riff raff at the election booth. no more backrooms and private meetings for them. no more huge donations in exchange for favours. it's about time. One “tool of the revolution” allowed hundreds of Vancouverites to organize a flash rally hours after the federal government announced it would buy the Trans-Mountain pipeline from Kinder Morgan to ensure the project gets completed amidst opposition. 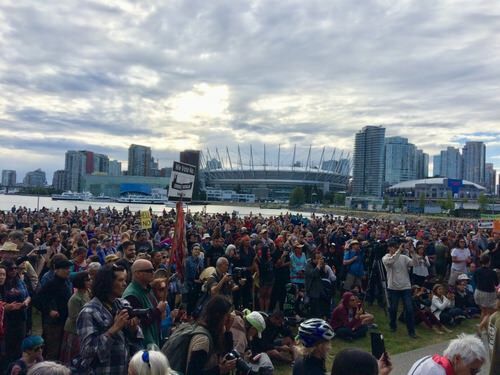 "Our phones," said Chief Bob Chamberlin, vice president of UBCIC, while holding his phone above the impressive crowd gathered outside Science World May 29. Looking at the diversity of generations, cultures and uniforms, it wasn't a far-fetched notion that technology had a role in coordinating a rally protesting an announcement that had just occurred that morning. Burnaby MP Kennedy Stewart, who recently announced he’ll run as an independent for Vancouver mayor, said Trudeau’s government is making a catastrophic mistake by buying the pipeline, but is confident Trudeau will be overpowered by British Columbia’s opposing voice. “Sending $4.5 billion to Texas isn’t going to change the fact that B.C. won’t let this expansion happen,” said Stewart, one of 200 citizens that have been arrested while protesting the Trans Mountain Pipeline expansion project. "Trudeau really doesn’t know us if he thinks this is going to be built." Kennedy said he's been fighting against pipelines since 2011 and has no plans to stop, no matter what it takes. “There are some polls showing that 12 percent of B.C.’s population is prepared to get arrested to stop this pipeline, and so many activist groups that I can’t keep track,” Stewart said, applauding online organizing efforts. Lots of carbon: Trudeau told oil executives last year that “no country would find 173bn barrels of oil in the ground and just leave it there”. That’s apparently how much he plans to dig up and burn – and if he’s successful, the one half of 1% of the planet that is Canadian will have awarded to itself almost one-third of the remaining carbon budget between us and the 1.5 degree rise in temperature the planet drew as a red line in Paris. There’s no way of spinning the math that makes that okay – Canadians already emit more carbon per capita than Americans. Hell, than Saudi Arabians. Is this a clever financial decision that will somehow make Canada rich? Certainly not in the long run. Cleaning up the tar sands complex in Alberta – the biggest, ugliest scar on the surface of the earth – is already estimated to cost more than the total revenues generated by all the oil that’s come out of the ground. Meanwhile, when something goes wrong, Canada is now on the hook: when BP tarred the Gulf of Mexico, the US was at least able to exact billions of dollars in fines to help with the cleanup. Canada will get to sue itself. No, this is simply a scared prime minister playing politics. He’s worried about the reaction in Alberta if the pipe is not built, and so he has mortgaged his credibility. His predecessor, Stephen Harper, probably would not have dared try – the outcry from environmentalists and First Nations would have been too overwhelming. But Trudeau is banking on the fact that his liberal charm will soothe things over. Since he’s got Trump to point to – a true climate denier – maybe he’ll get away with it. Do you support B.C.’s premier in his ongoing battle to stop the pipeline project? Take our poll and leave your comments. So what? It's the people of BC and those in the path of the pipeline that will stop the pipeline. An unscientific poll is meaningless. In a democracy we get to speak up between elections too and if enough of us do it the government sometimes backs down. If Trudeau had run on a platform of buying Transmountain in the NATIONAL INTEREST instead of his promise to subject its expansion to a rigourous regulatory scheme he would have won almost every seat in Canada, especially in Vancouver. A few days before Bill Morneau announced the federal government’s plan to buy the Trans Mountain pipeline and take charge of its expansion, my morning newspaper displayed the collision of forces behind this decision. On one page of the newspaper was a story about the pipeline’s expansion, and on the facing page was a story about cities on B.C.’s coast planning to build seawalls and abandon low-lying land to cope with rising ocean levels caused by global warming. Maybe the contrast was the choice of a clever editor, or maybe it was chance, but it revealed the dangerous double standard our society is straddling. Like a heavy smoker who wakes every day to a hacking cough but refuses to face the health hazards of cigarettes, Canadians wake every day to the consequences of burning fossil fuels but refuse to reduce our emissions. While the Justin Trudeau of the Paris Climate Accord was telling us we should quit, Bill Morneau just bought us another carton of smokes. It’s a fact of politics that governments often hold contradictory positions. We want more trade with China but don’t want to give up sovereignty. We want higher public services but lower taxes. Governments can fudge these contradictions, sometimes forever, because taxes, public services, money, trade, and nation-states all exist as social constructions. Our national borders, currency, health care system, and human rights can all be changed with the stroke of a pen. Global warming is an entirely different kind of issue. While there are plenty of social concerns around the Trans Mountain pipeline, including the rights of First Nations and provinces, at its foundation the pipeline matters most because it is part of an industry that is dramatically, dangerously, and permanently changing our physical world through global warming. Once they are gone, no stroke of a pen will bring back our disappearing glaciers, our submerging coasts, or winters cold enough to stop pine beetle infestations. Some double standards are downright dangerous; a government can fudge its promises but it can’t fudge the laws of physics behind global warming. Something else is intensifying and accelerating too: the transition away from fossil fuels. While Bill Morneau uses taxpayer money to buy and expand pipelines, governments and corporations in much of the rest of the world are investing heavily to make oil obsolete. About seventy per cent of Alberta’s oil and bitumen ends up as transportation fuel. Every major carmaker on Earth is transforming their vehicles to electric power within the decade. Electric utilities are rapidly converting to wind and solar energy. Letters will be sent by the City of Castlegar and Village of Slocan in the Kootenays and the District of Sooke on Vancouver Island to Chevron, ExxonMobil, Shell and 17 other fossil fuel companies asking the companies to pay a fair share of their local climate change costs. In addition, the Association of Vancouver Island and Coastal Communities (AVICC) will vote this Saturday on whether to send its own letter to the same fossil fuel companies. These three municipalities in very different parts of the province bring to ten the number of BC local governments sending these letters to fossil fuel corporations. Their actions collectively challenge the assumption that their taxpayers alone will pay for the costs of preparing for climate change. According to polling commissioned by West Coast Environmental Law, 75% of British Columbians support their local government sending climate accountability letters. Fossil fuel pollution caused by the operations and products of just 20 major companies represents about 30% of human-caused greenhouse gases in the global atmosphere today. CCF strongly in favour of corporate bailouts. Why pipelines won't result in lower gas prices. Fake Poll, To double check if this poll is fair I tried multiple times voting Yes and Voting NO, Voting yes was accepted only once, Voting NO was duplicated and I tried 10 times and accepted me to vote NO 10 times. As for the voting booth being the place for input, I am sure you must be joking (you don't seem that dumb). Because they would result in a higher GNP, rather than cheaper dinosaur juice for us individually? To be fair, cheaper gas primarily benefits drivers. Really? I voted a week or so ago in the Vancouver Sun. Today, I had to vote to see results but it said I had already voted. I just tried the polldaddy link and it also said I voted previously. 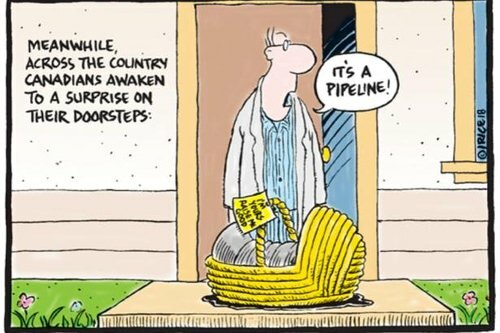 I realize that confirmation bias doesn't allow the faithful to accept any data that does not reinforce the dogma but the rest of us can draw our own conclusions that the activists only speak for themselves, not all of BC or even a majority of BC residents or, for that matter even a majority of self- described pipeline opposers. But apparently, you are dumb enough to get all tanglefooted over a very simple premise. There'd be no work for tinkers' hands. Fake news about a legitimate poll whose results you don't like. I can't vote twice, even clearing cache and cookies. Try: "Why lack of pipelines will raise your gas prices". Then address to: John Horgan, economics dumbass. Voting isn't limited to BC and isn't representative of the population. There is no weighing of the results to reflect the population. Aside from that we are protected from majority rule by the rights we hold through different levels of government. At this point there are only two remaining factors. First the legal. The courts have not yet cleared the pipeline for construction. Second, the strength of local public resistance. Arrests in the thousands and/or indigenous grandmothers sitting in prison would be a problem. On that score it is a game of chicken. Canadians poll for the pipeline by a small majority, but they are against financial investment by a much larger majority. When Quebecers were asked they were strongly against hijabs in the workplace, but at the same time they also said women shouldn't lose their jobs over it. That Canadians or BCers approve the pipeline doesn't mean that they approve of all measures to get it built. They are against the financial investment. Trudeau is hoping that once it belongs to Canada the pressure on BC will be much more intense as Canadians stand to lose not only potential income but also billions in taxpayer investment. That is why they are after pension funds too. They are trying to get enough political capital to go hardline on BC protesters. Sorry to answer you in a roundabout way. I watched the Harcourt/Clark governments slowly remove the poor from their agenda. I knew many of the political operatives, and I new their values were solid. However navigating the politics pushed them to abandon issues they otherwise would champion. People who did champion issues were limited to small individual victories. The problem wasn't getting the right team or leader, it was changing the pressures they face. I basically walked away from organized politics. I go to meetings and I support the NDP. But I understand that they are mere instruments that react to the forces in the world. Instead I worked with local activists about creating forces for the issues that were important to me (poverty and housing). I can easily say that I accomplished way more outside the political world than within it. So when you say an asinine statement like the voting booth being the only input for citizens I just have to shake my head. Electing the best politician is important, but far more important is making sure that when politicians look out they see the issues that are important and that will only happen when people are engaged and have their voices heard between elections. Well said Pogo. I too had a similar experience with the BC NDP. Federally in Burnaby Douglas we just ignored the central office and campaigned from the left and elected people to speak truth to power. Unfortunately that did not end really well. Both are needed. Political parties are driven by the need for broad public support. Activists have particular issues they want to influence the public and government on. When activists become politicians they either can't win or they must compromise their principles to do so. Yeah well, you can talk all you like but the only power to change anything rests in your vote. Elections are all about throwing out tiresome losers. The problem today is that everyone is talking and no one is listening. I agree with the rest of your post. Incremental change and small victories are the results of hard work, not from appealing to politicians. Up to this point, the protesters have had it pretty much their own way. Now, the pro-pipeline forces are beginning to rouse themselves. Indigenous entities are looking for equity stakes and are speaking out against activist manipulation. Activism has caused such focus on this project that it will be a best in class project setting global standards but it's time to stop the rhetoric and come together in the best interests of the country. I realise that an entrenched opposition of professional activists like Tzeporah Bermann are hanging their hats on stopping this pipeline but our federal apparatus has belatedly realised the quagmire they themselves created by allowing the activists free rein. Mr. Dress Up has effectively cornered himself and, like a trapped rat, he will become dangerous. The authorities, as opposed to the political order, are well aware of the negatives associated with crowd control but if they tuck tail, there will be no end of malcontents using legitimate protest to incite disorder. They must ensure civil order. On January 19, 2018, Winona LaDuke—an internationally renowned environmental activist working on issues of sustainable development and renewable energy—gave a public talk in Vancouver, BC. This event was sponsored by the Canadian Centre for Policy Alternatives – BC Office (CCPA-BC), the Corporate Mapping Project (CMP), Indigenous Climate Action, West Coast Environmental Law, The Leap, UBCC350, and Greenpeace Canada. Seriously? You think anyone will pay for countering babble activism? Not even the Russians will pay a rouble, much less a currency actually worth anything. :) Sorry, no pay. It's simply a public service. The stunning amount of conjecture and misinformation anti-pipeline activists can manufacture must be countered, not lapped up. Let decisions be made based on fact, not misdirection. Your manufactured insinuation that I am a paid troll 'attacking' activists is the expected misdirection and delegitimizing of a personally held opinion in order to stifle dissent to anti-pipeline activism. This pipeline battle is only about marine protection for the locals. It is about land claims only for the indigenous. It is about climate change only for the econuts but mostly it is a line in the sand for the adherents of the global socialist order that is still fuming over the fall of communism. They are the ones prepared to instruct useful idiots on how to "lay in front of the bulldozers".